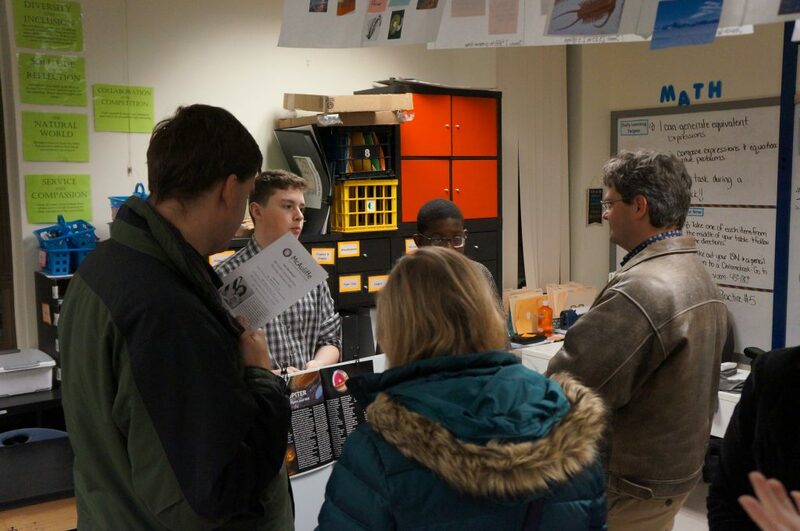 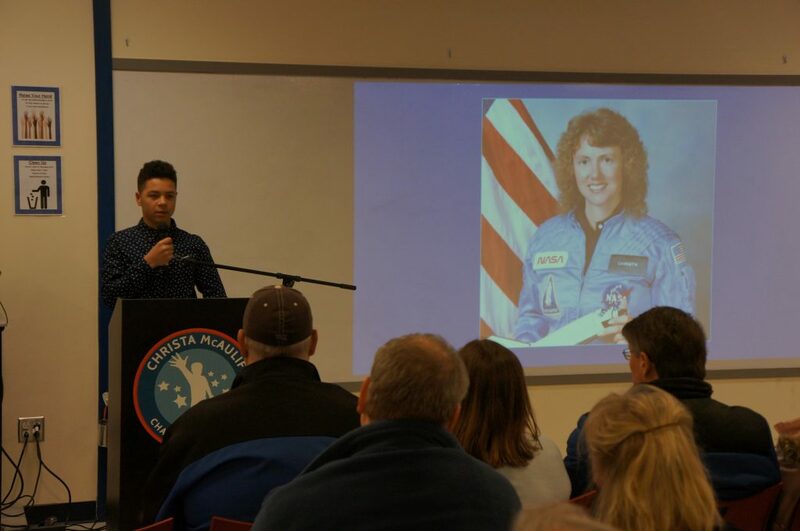 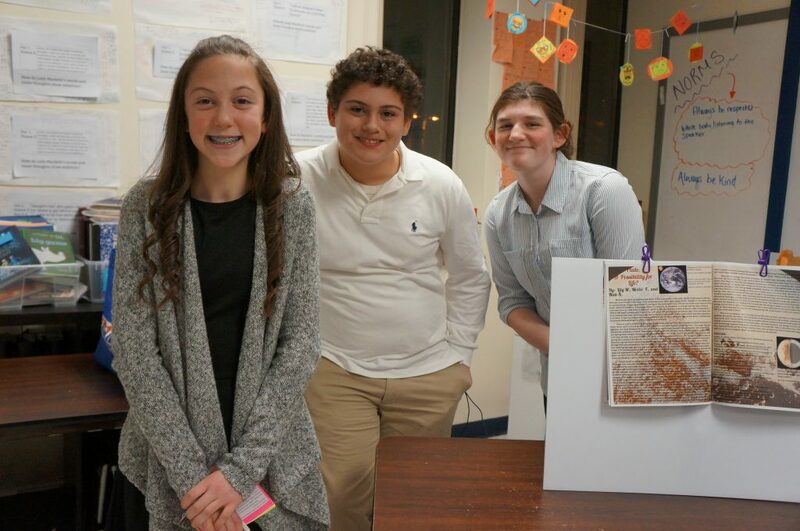 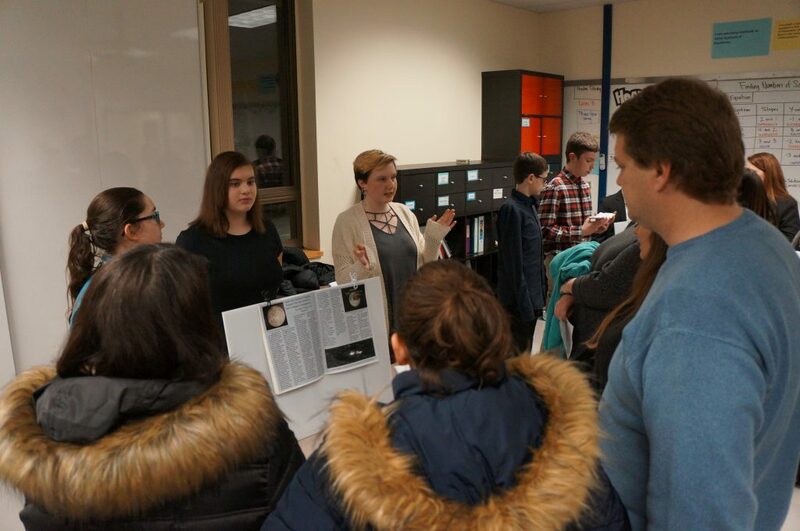 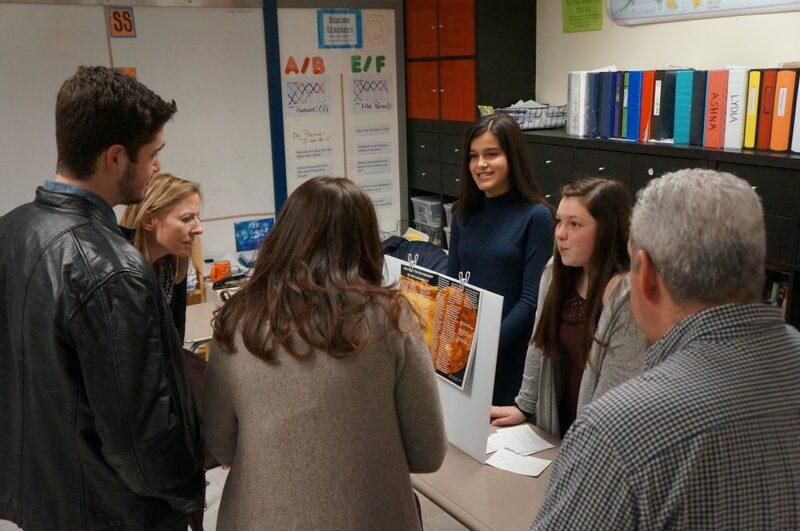 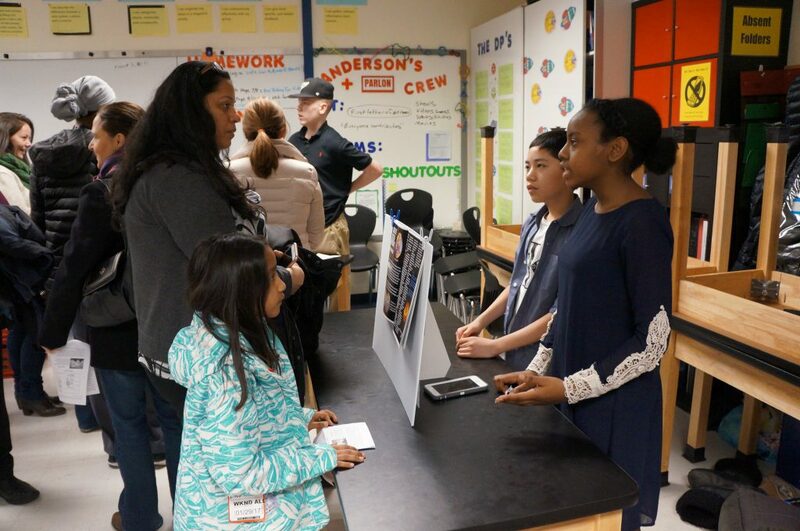 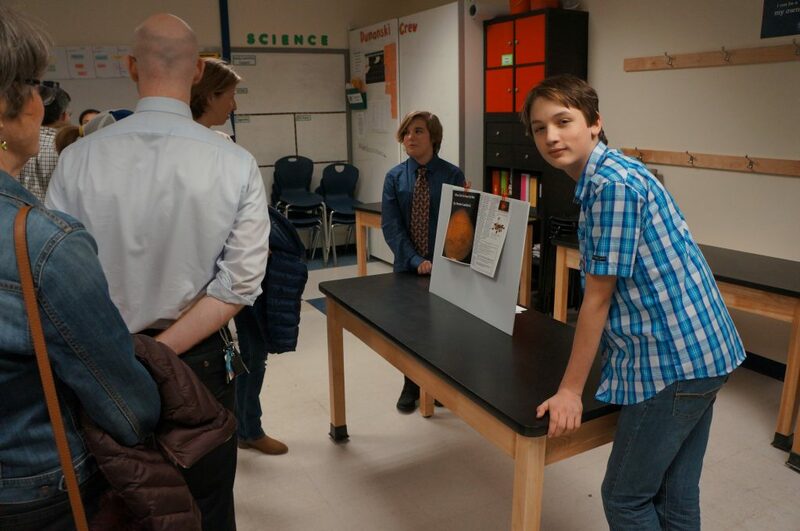 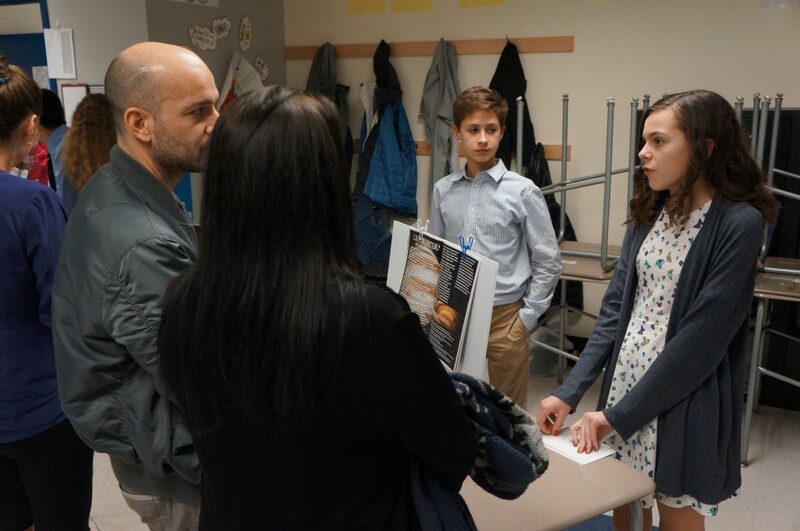 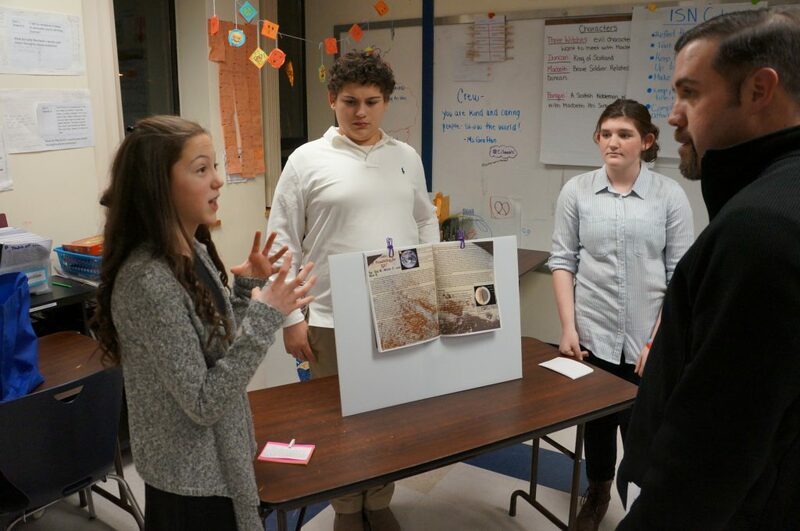 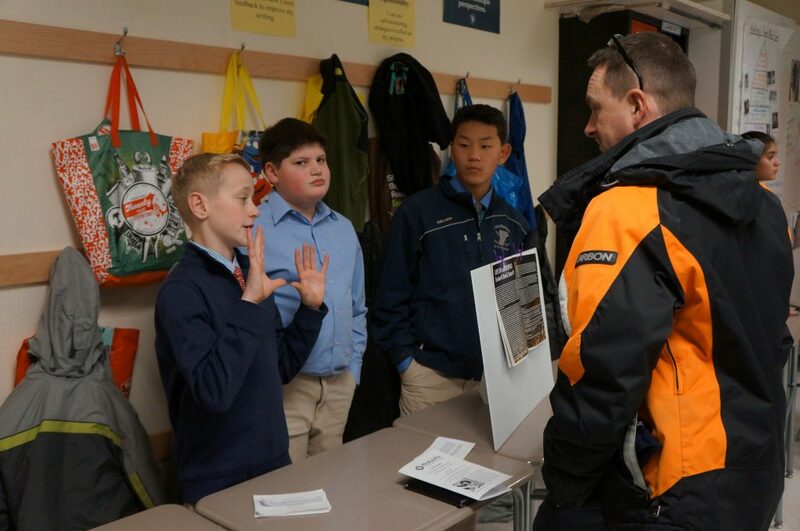 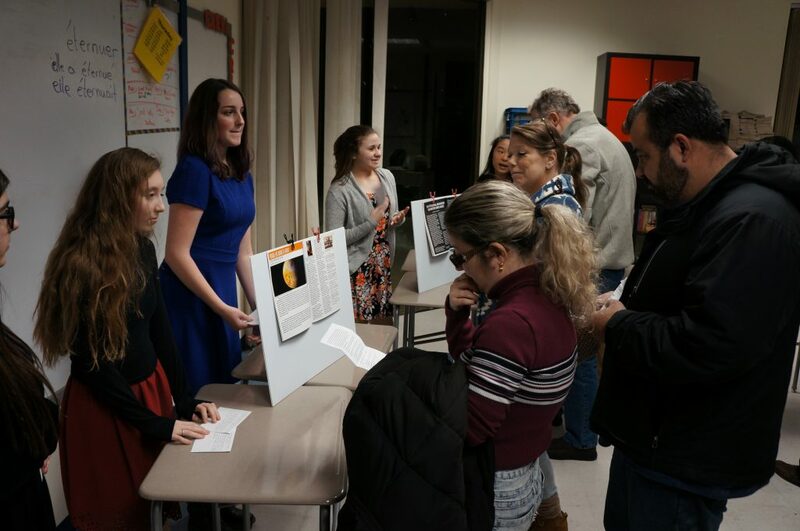 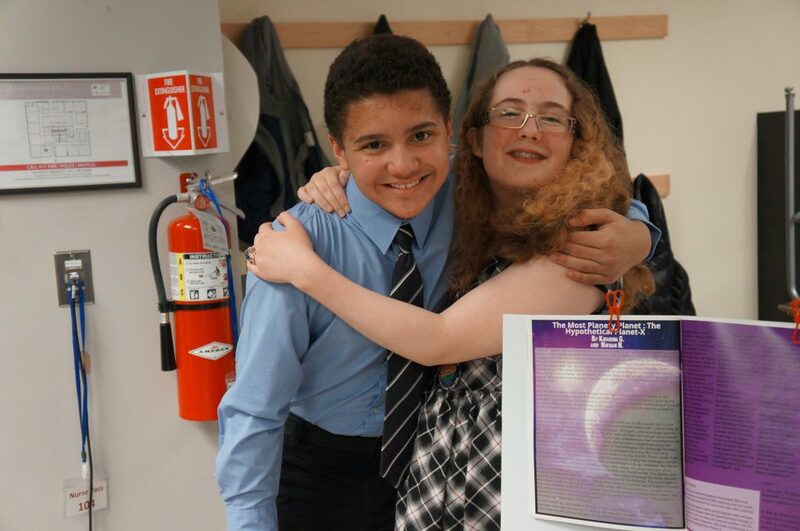 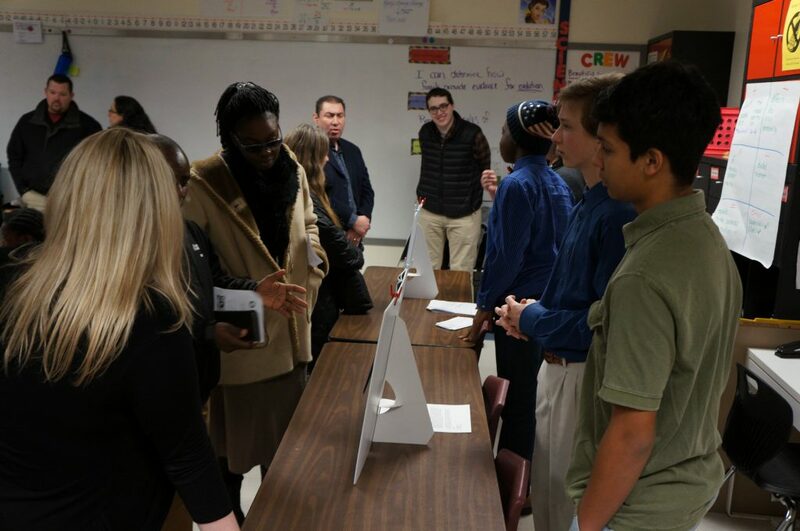 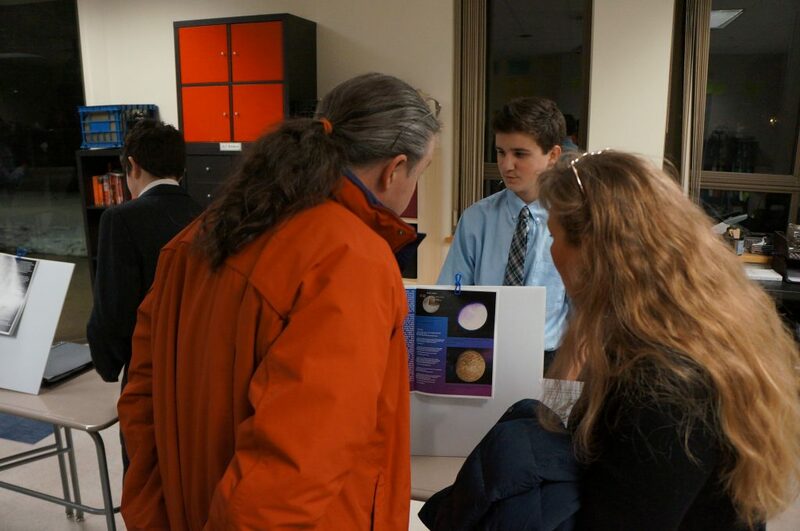 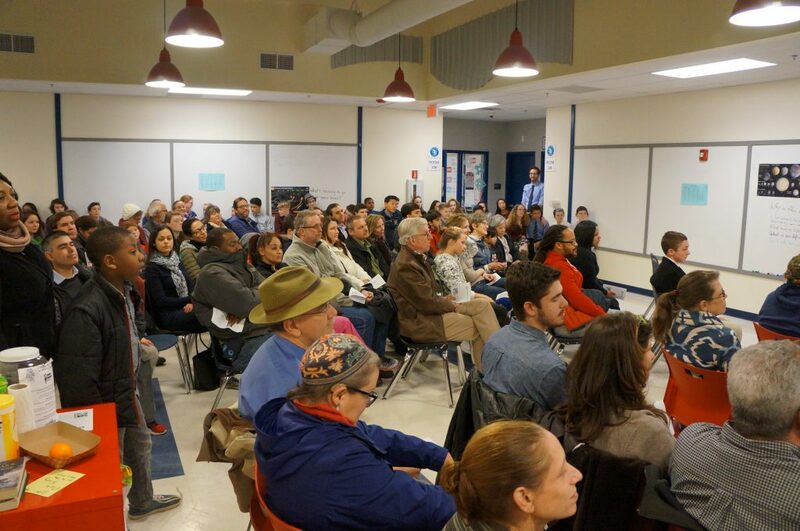 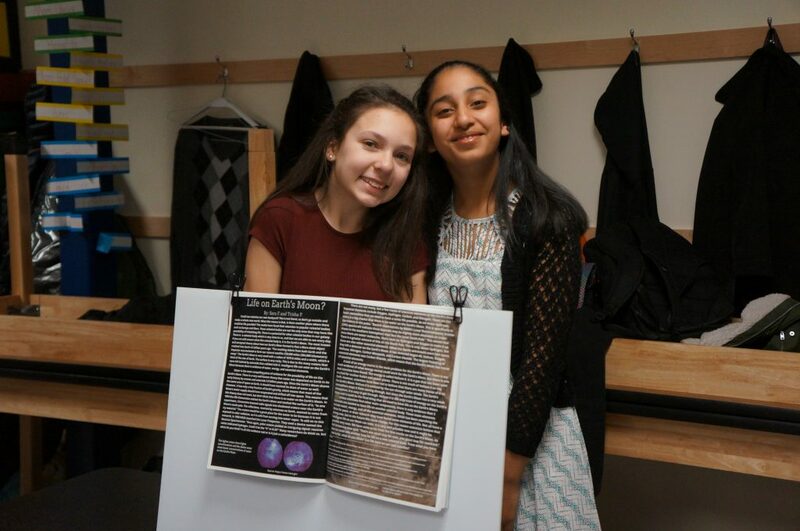 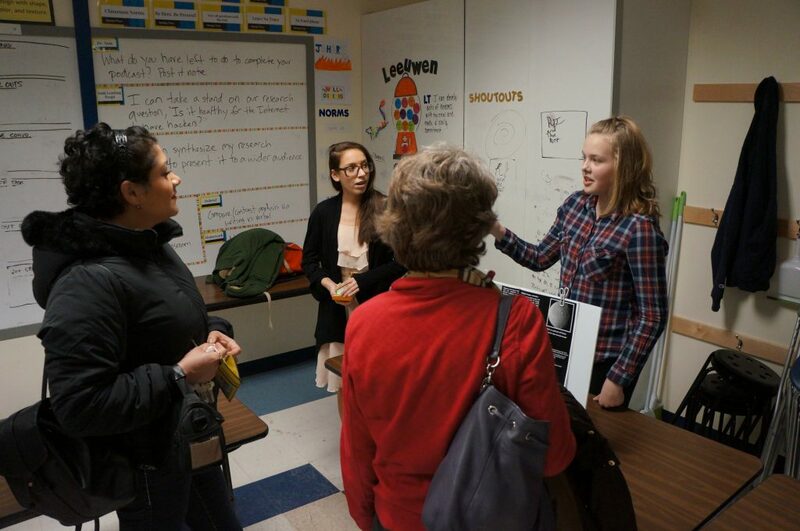 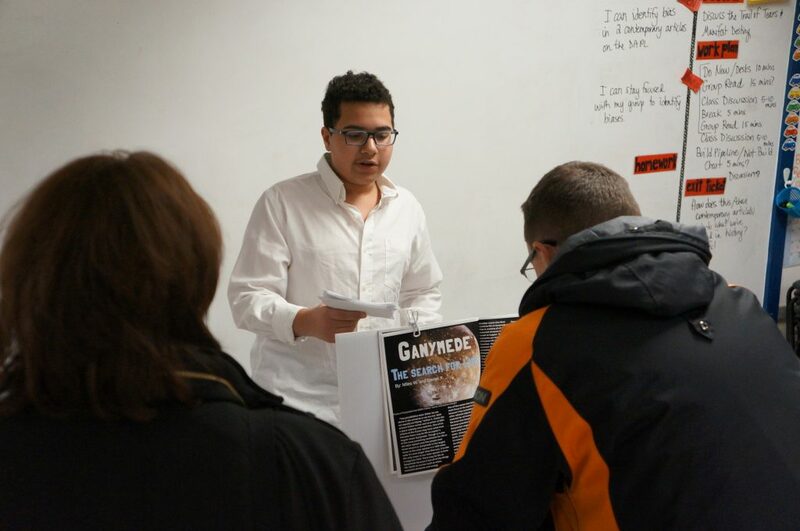 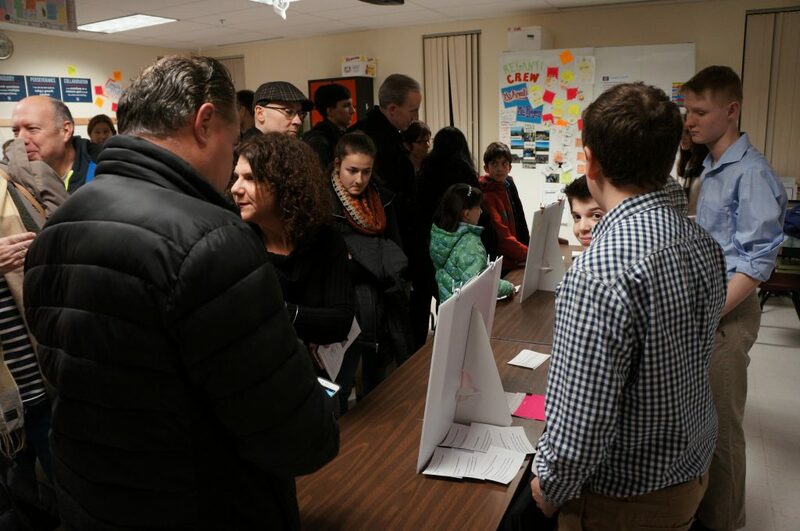 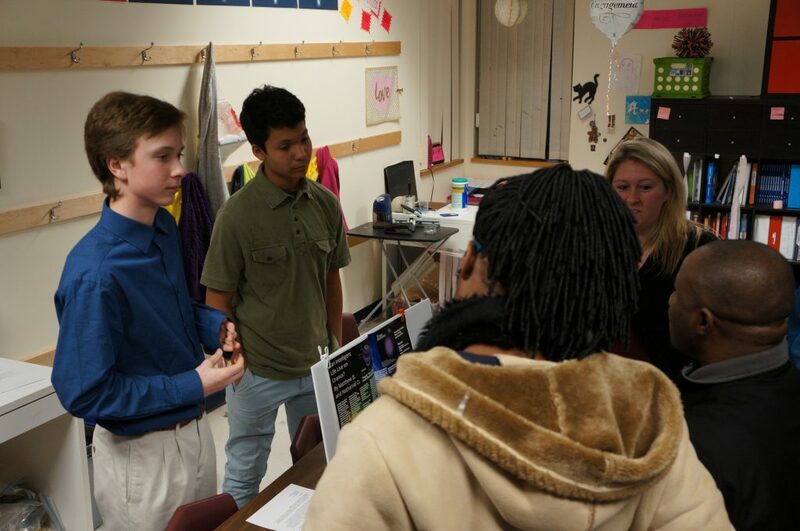 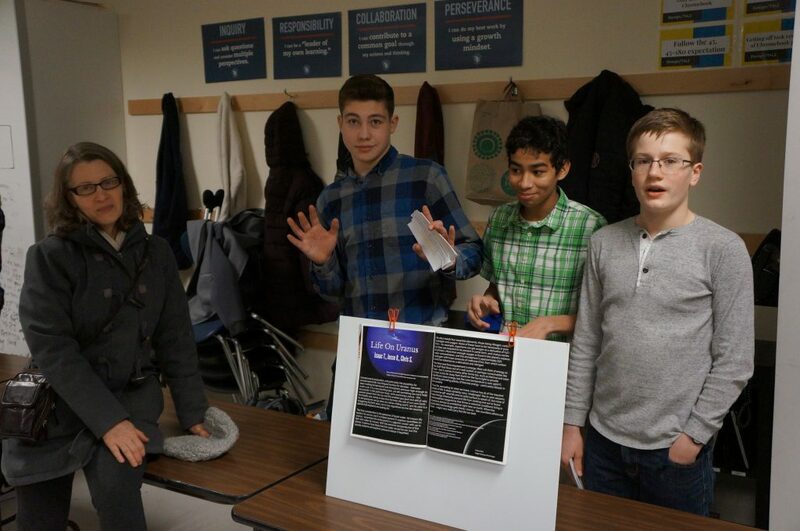 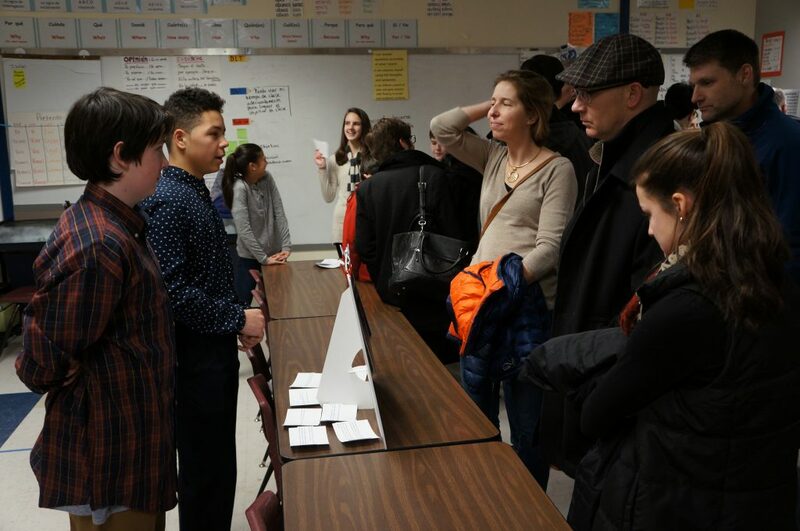 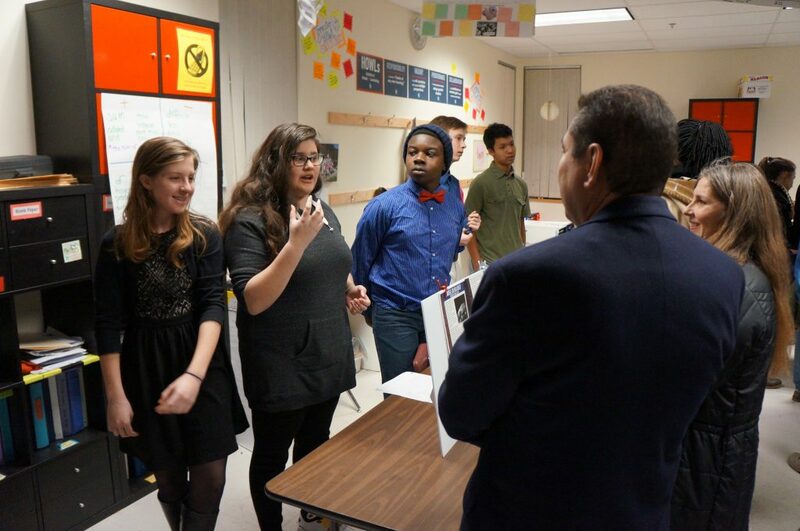 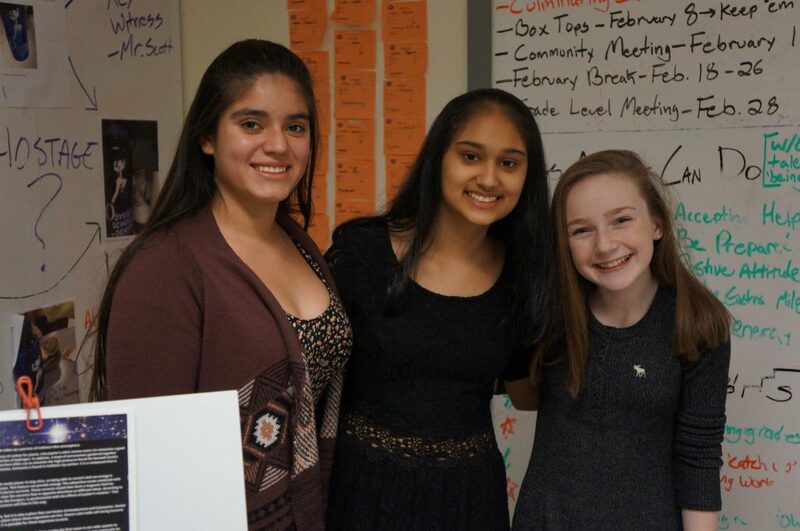 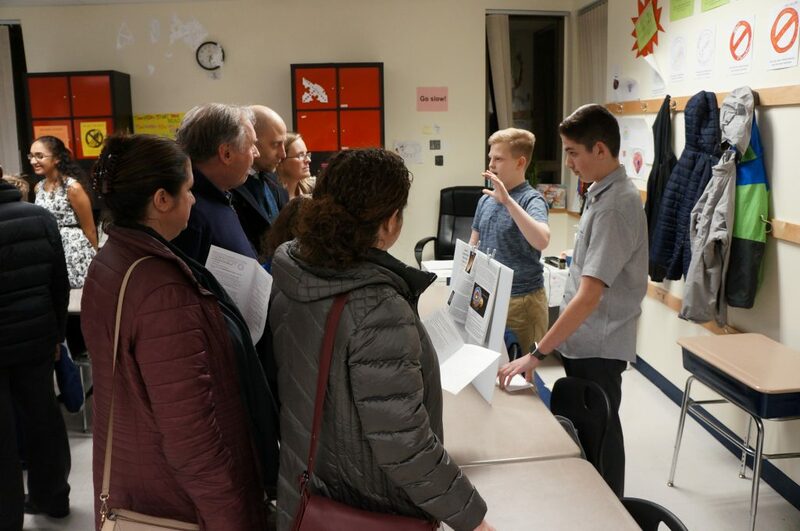 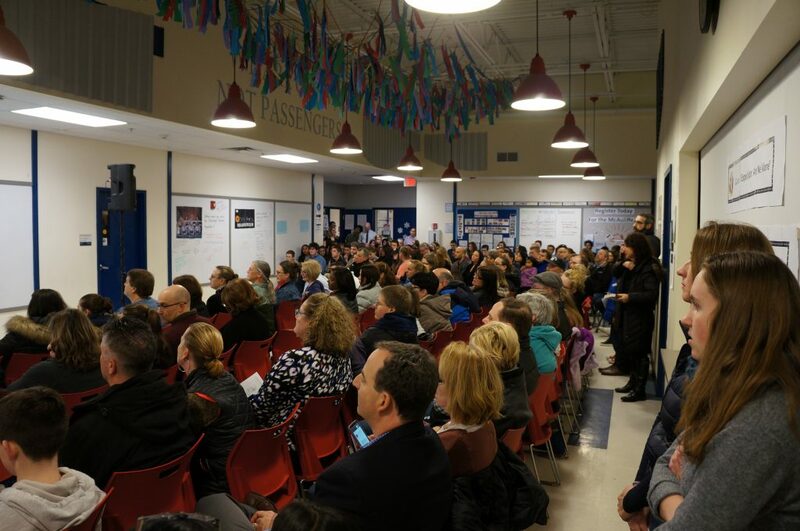 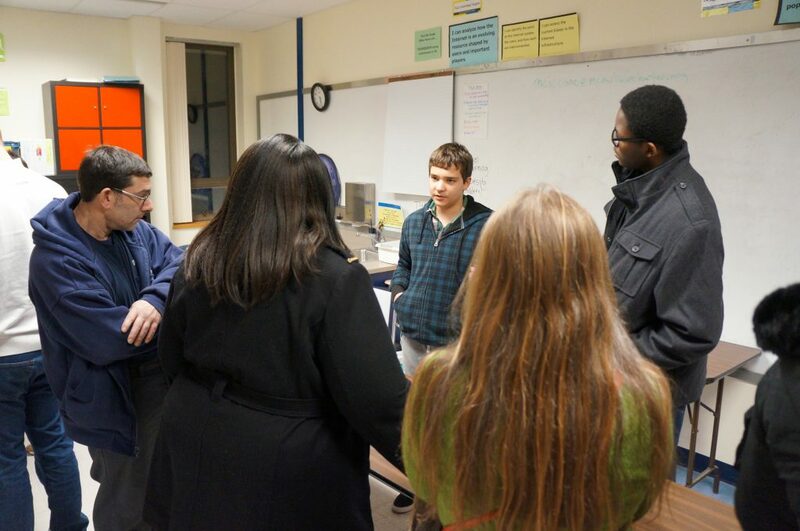 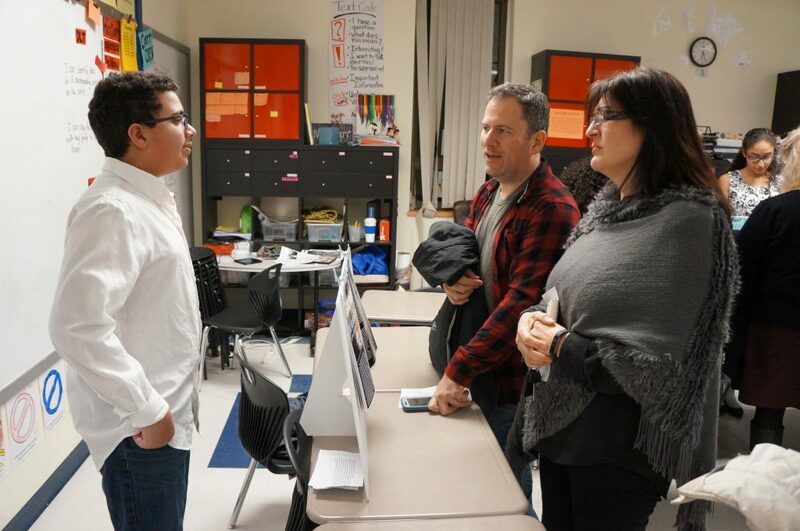 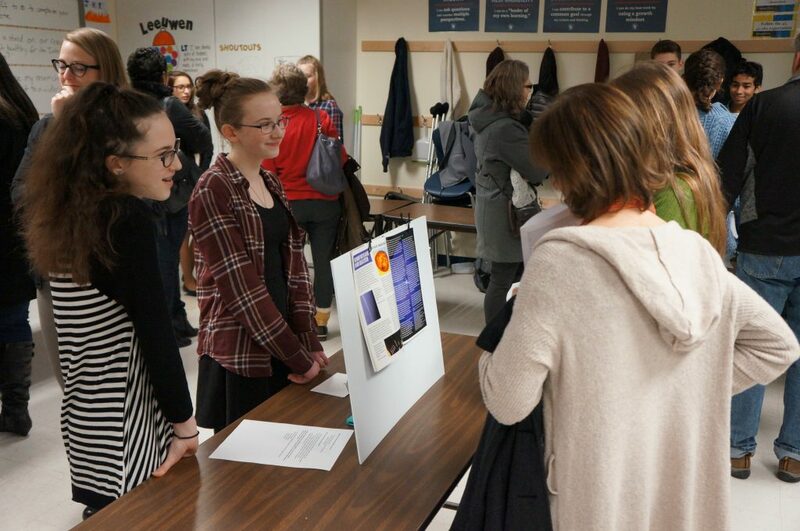 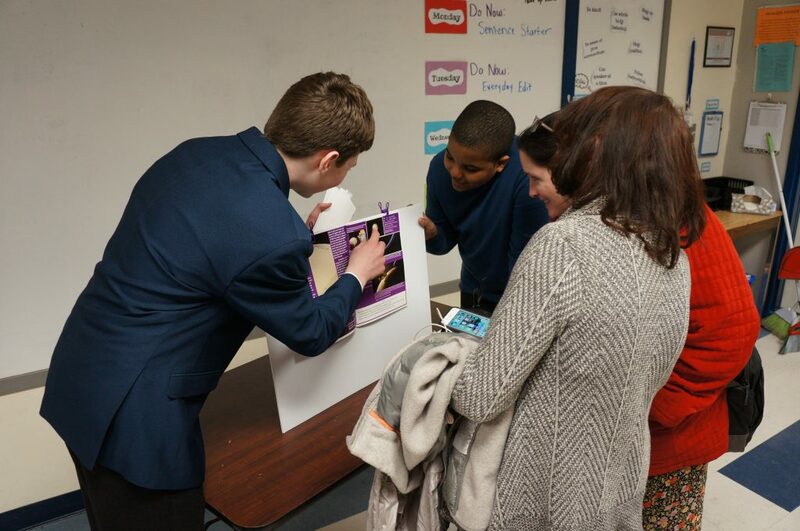 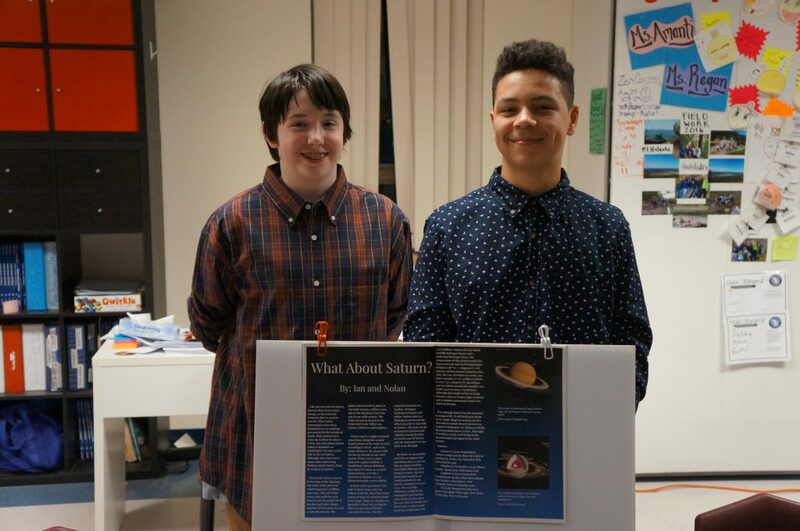 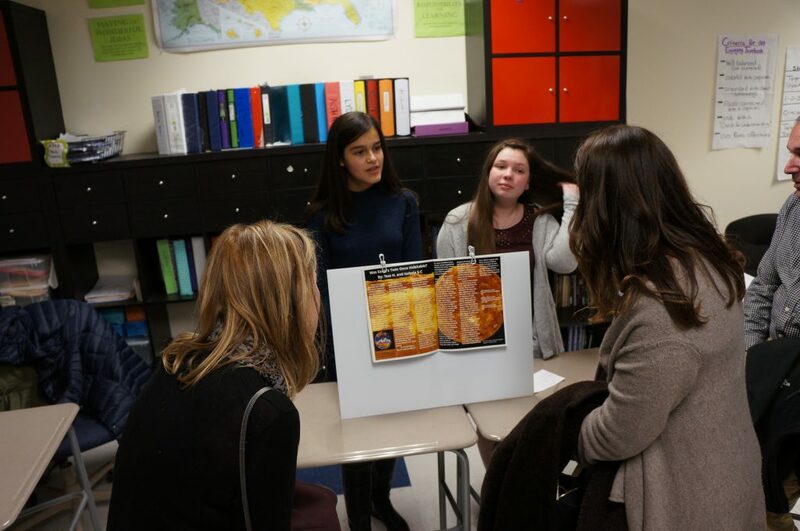 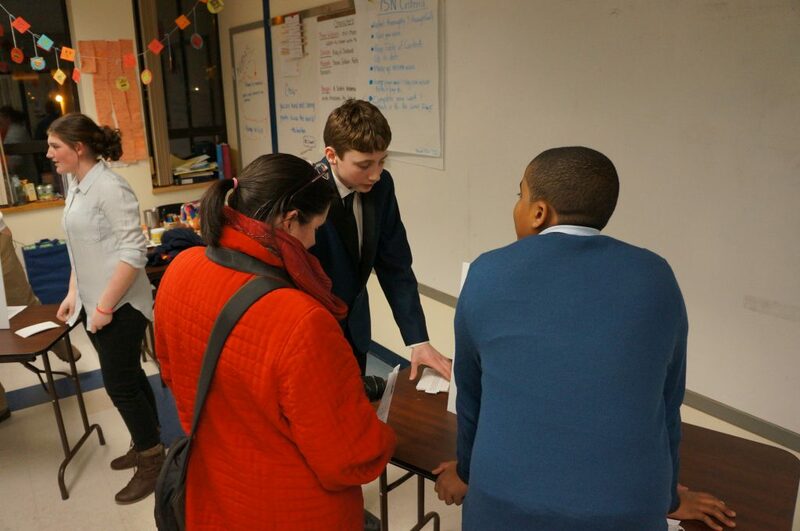 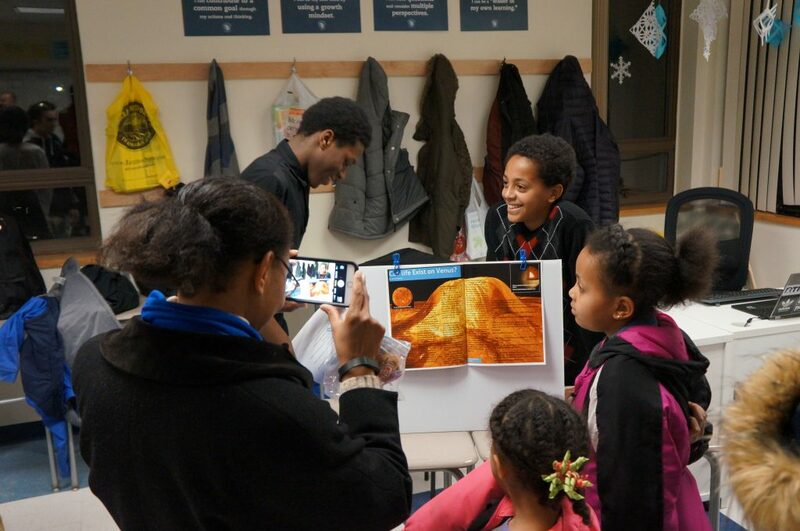 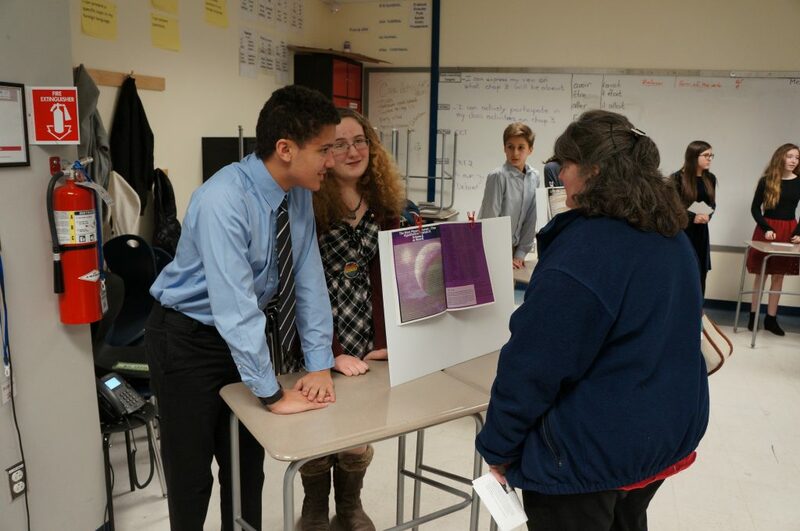 FRAMINGHAM – Grade 8 scholars from the Christa McAuliffe Charter School presented results from their learning expedition “Are We Alone?” to a packed house recently. 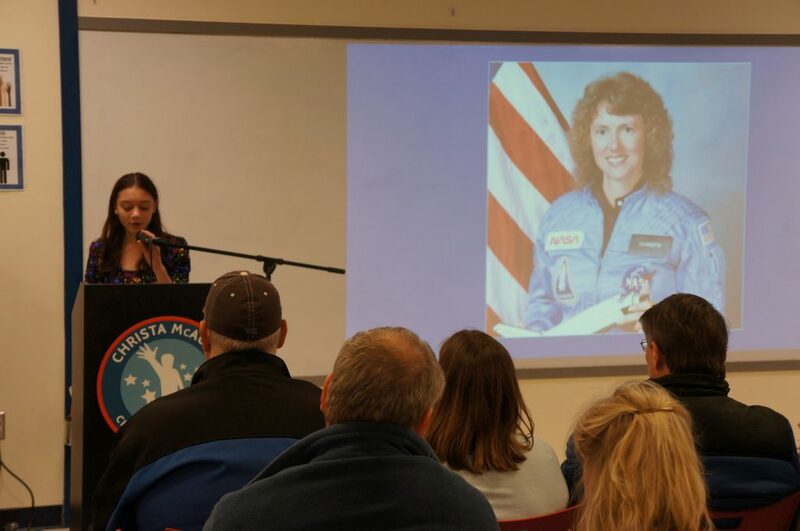 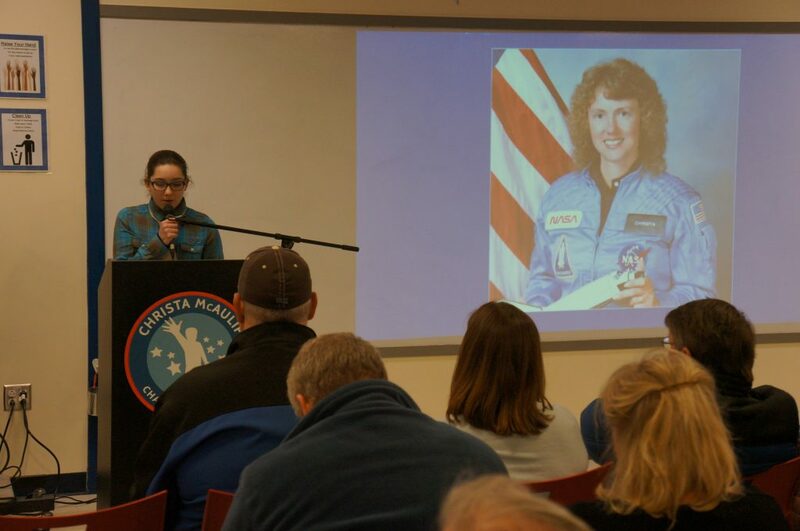 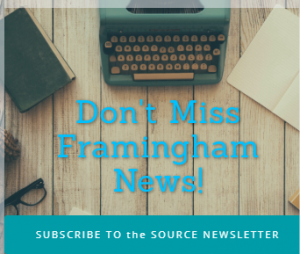 The annual event also remembers whom the school is named for – Christa McAuliffe, a Framingham native and the first teacher in space. 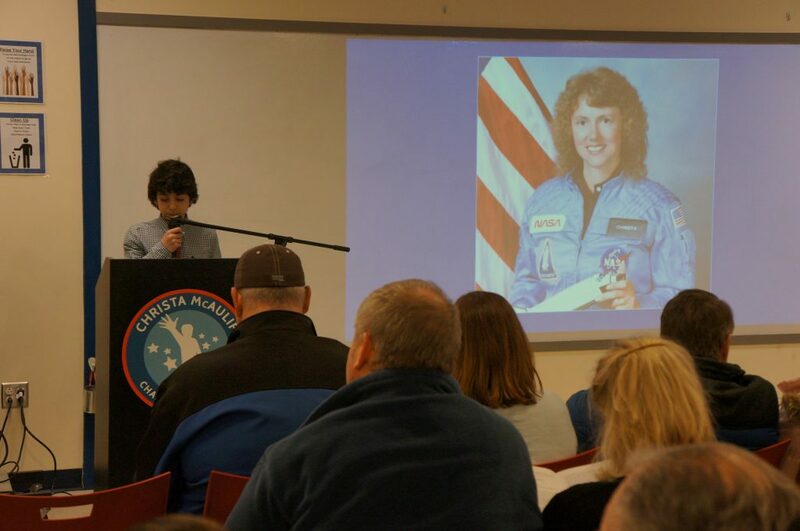 January 28 marked the 31st anniversary of the Shuttle Challenger disaster. 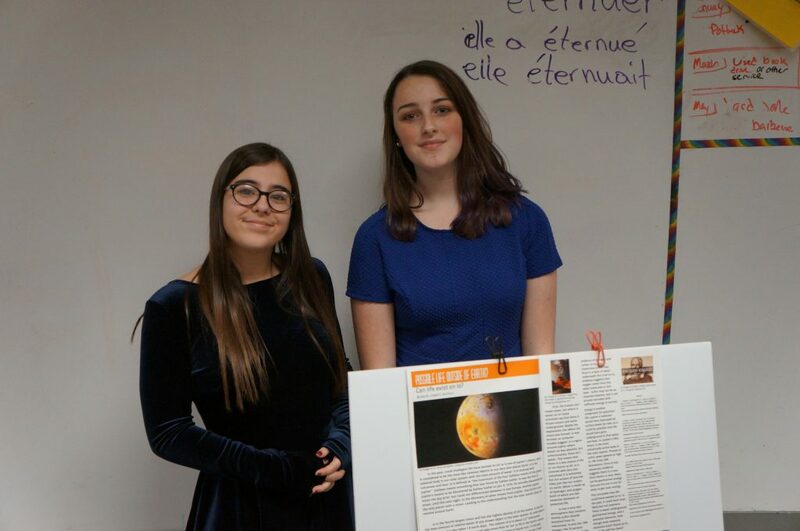 Could life exist outside our planet? 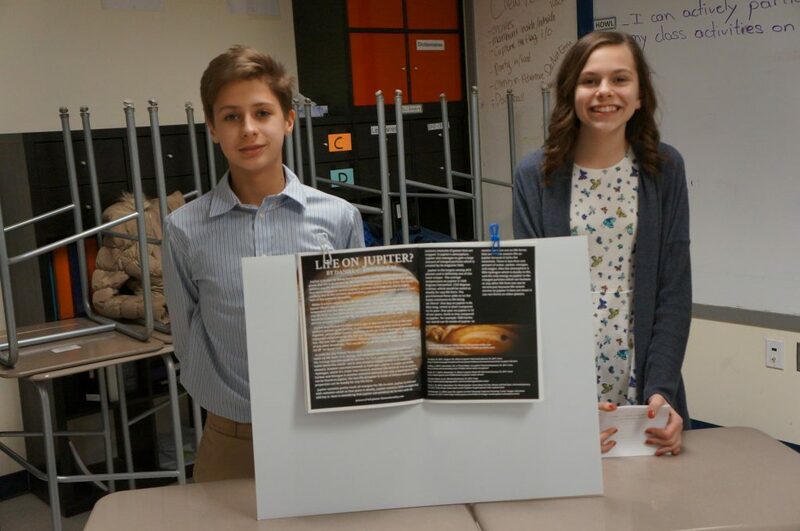 Where is there water, essential elements, or energy in the solar system? 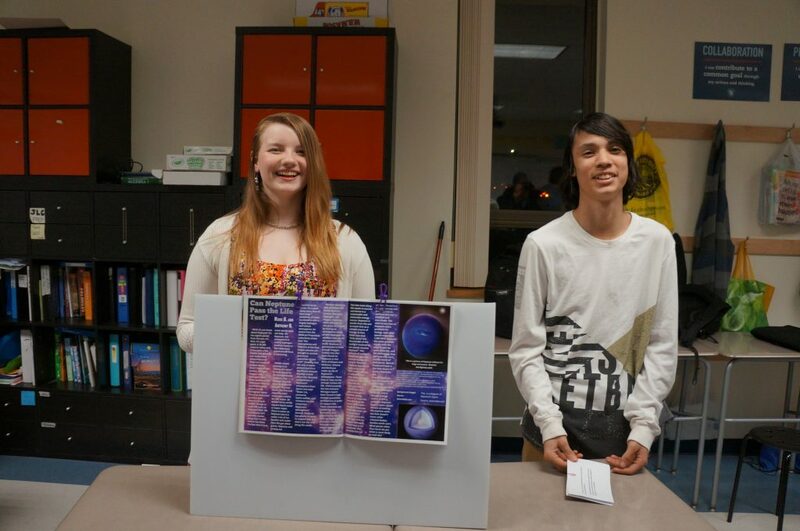 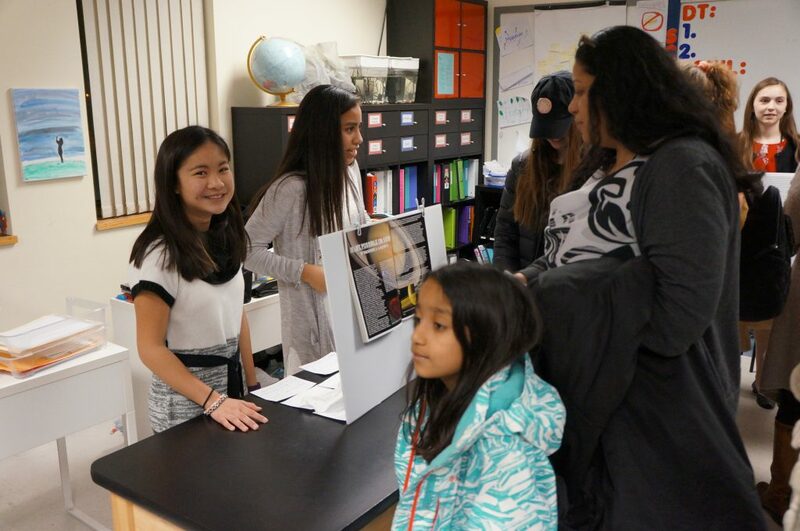 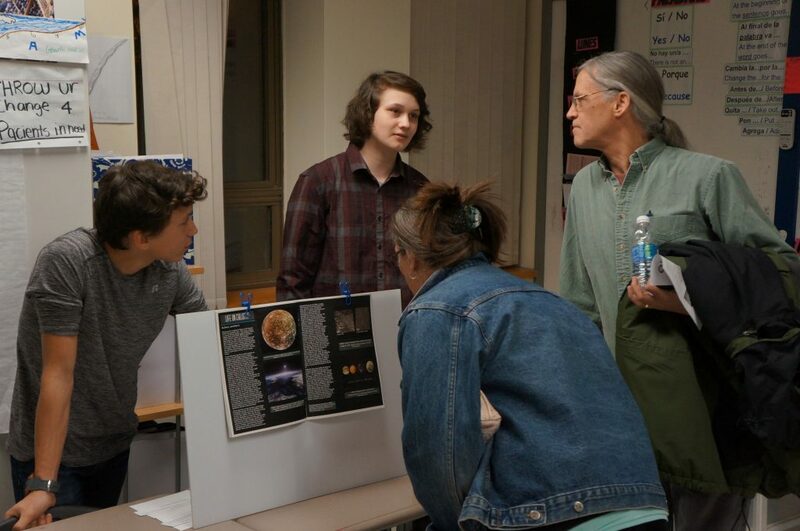 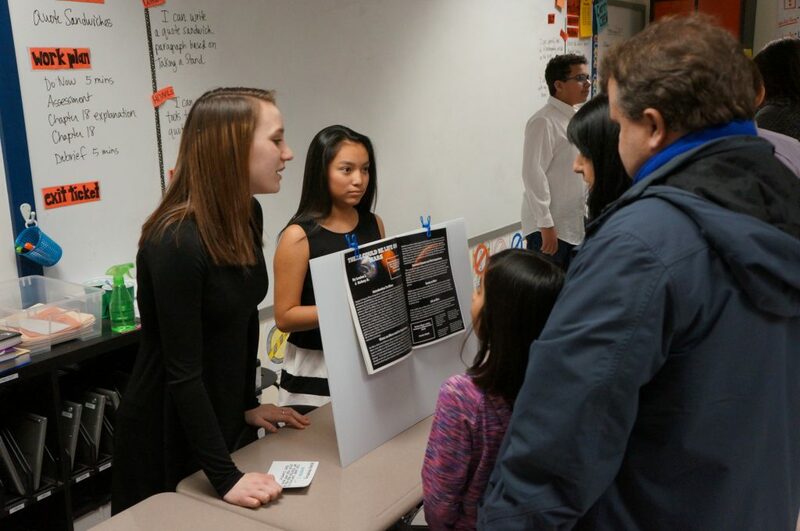 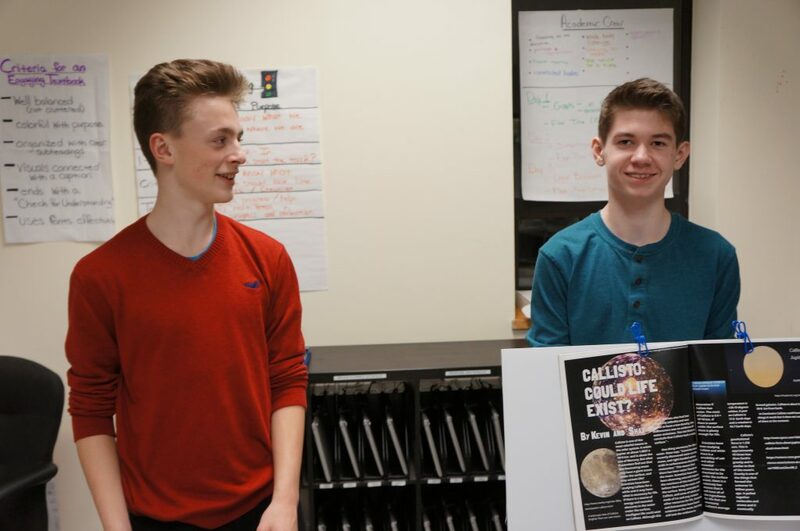 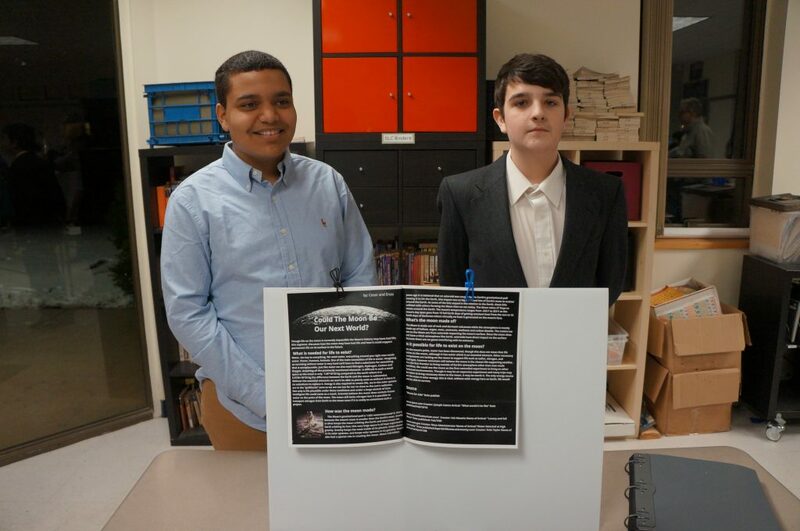 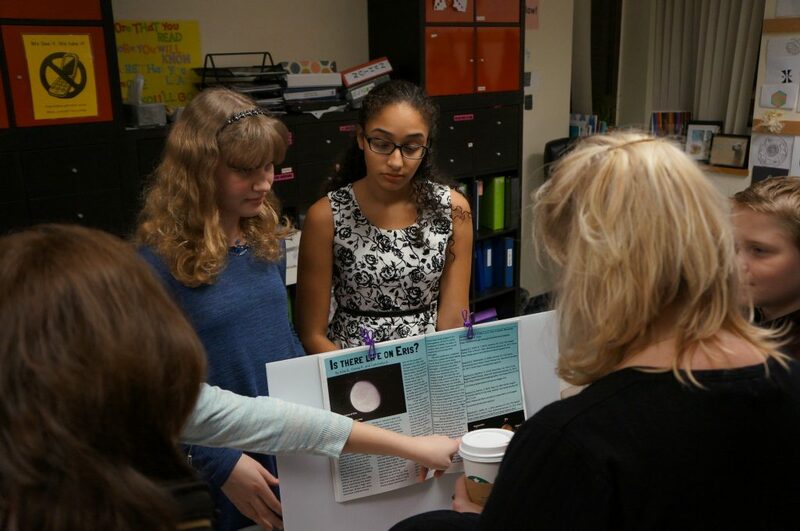 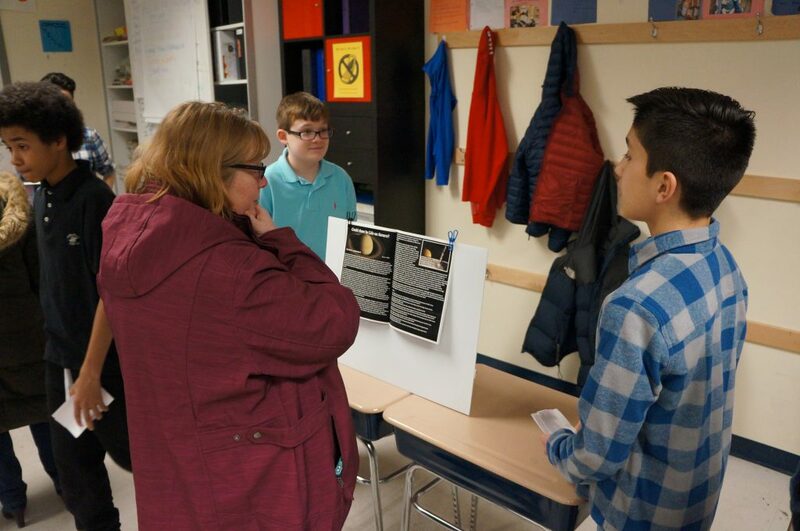 Building background knowledge on space, scholars participated in two case studies where they deepened their understanding of what it would take for life to exist on other celestial bodies. 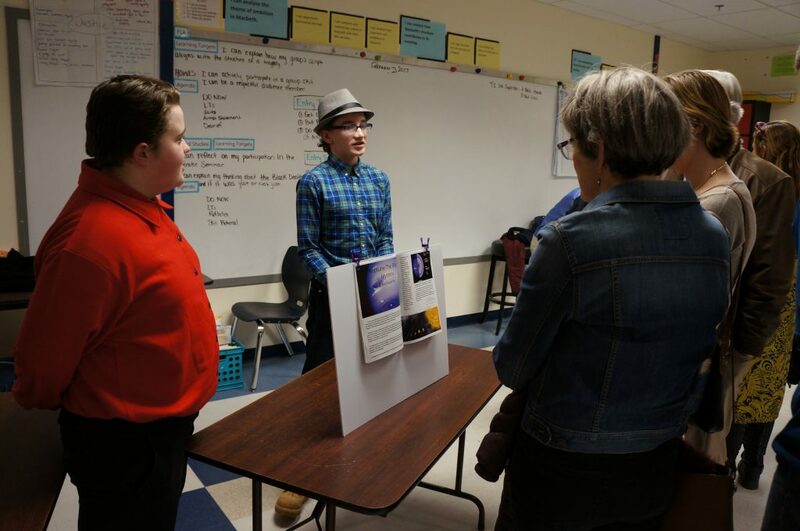 Scholars worked with Dr. Alexander van der Horst, an exploding star and gravity expert, who helped them understand the importance of gravitational force to formation of celestial bodies in space and whether life could actually live on them. 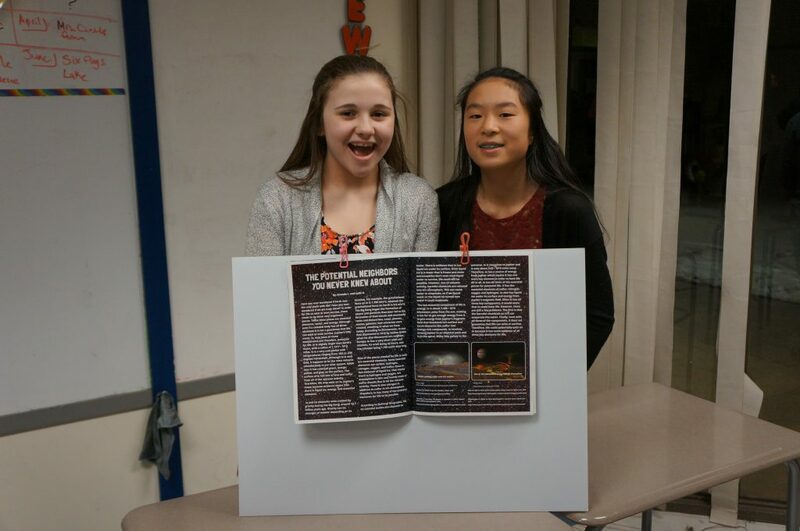 Their final product for the expedition was to coauthor a scientific magazine article. 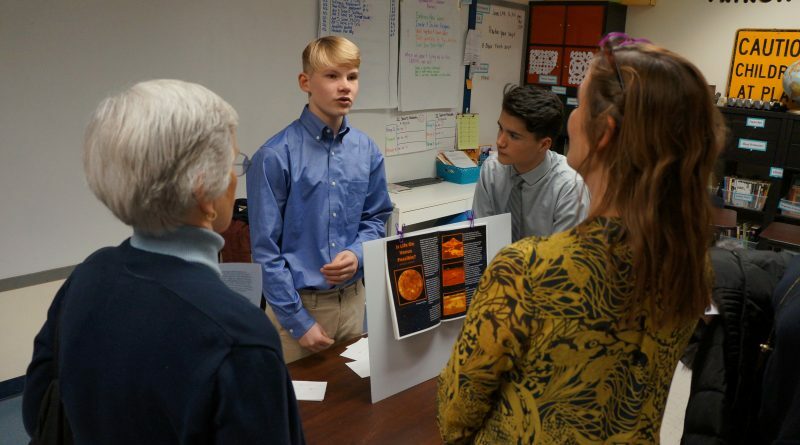 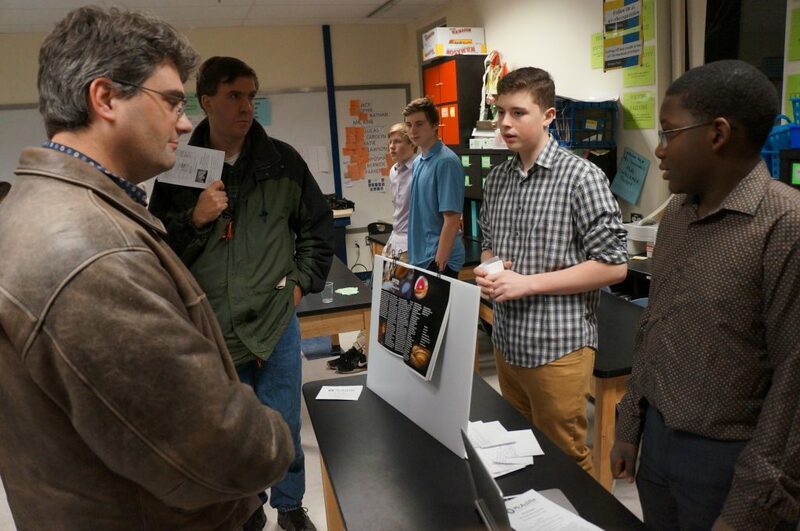 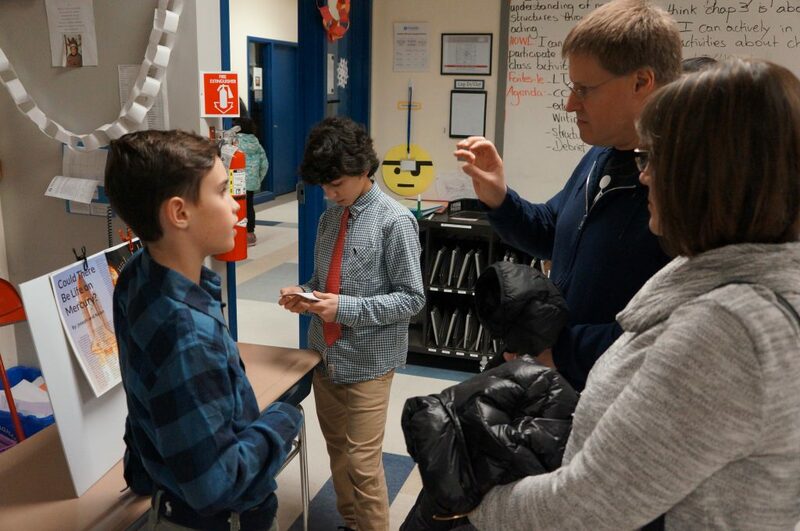 Scholars worked with two experts, Bart Leahy, a professional scientific writing consultant, and David Hewitt, a former NASA rocket scientist and current propulsion engineer. 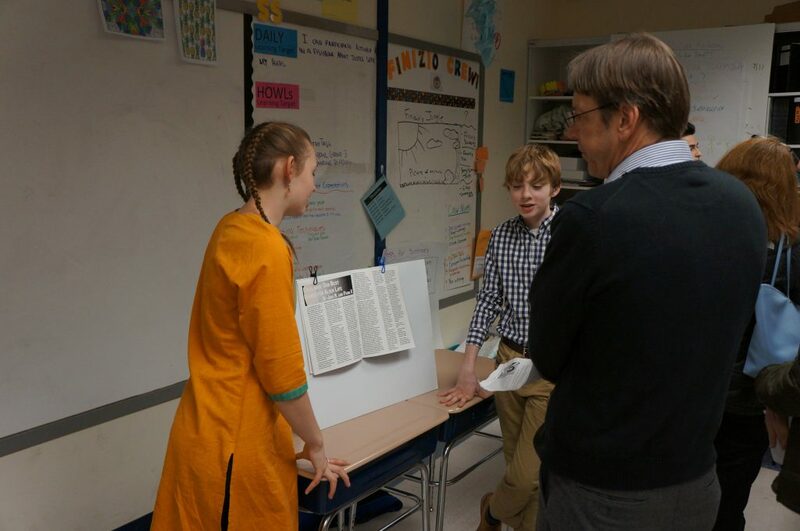 These experts stressed the importance of accepting feedback and shared tips on how to write in a way that will engage the reader. 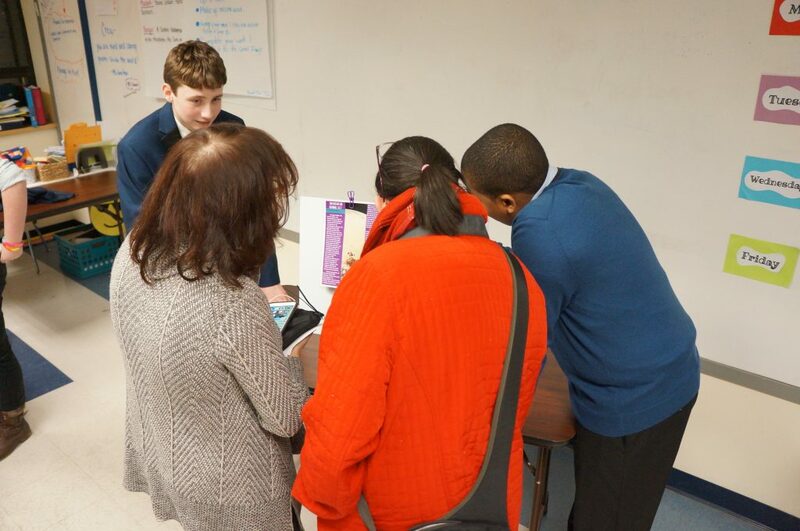 Neil Henderson, the owner of Freedom Digital Printing, taught our scholars how the layout and design process works in publishing. 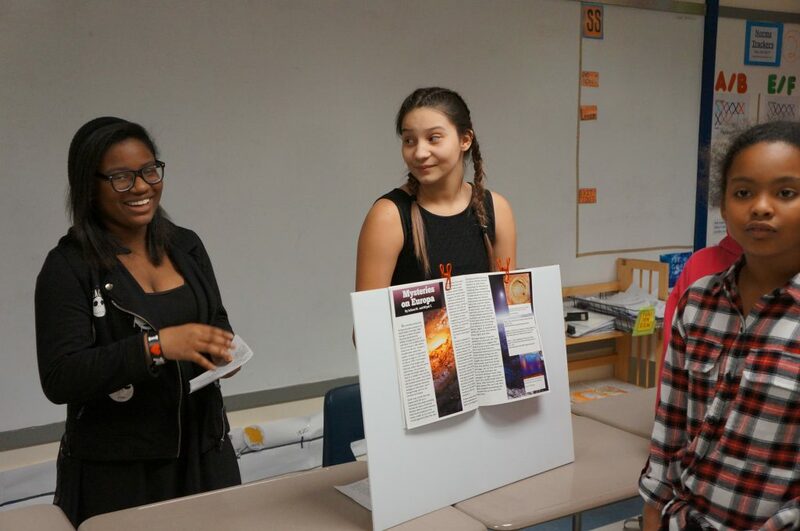 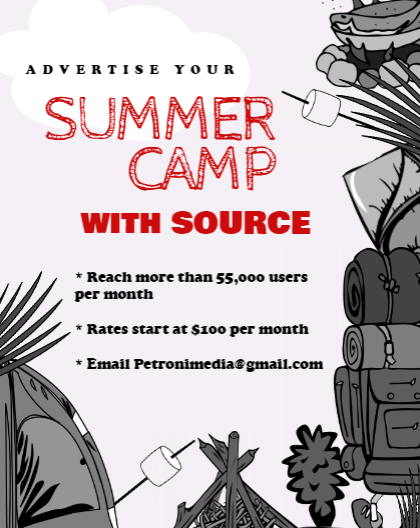 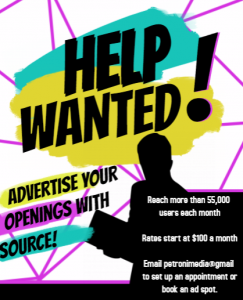 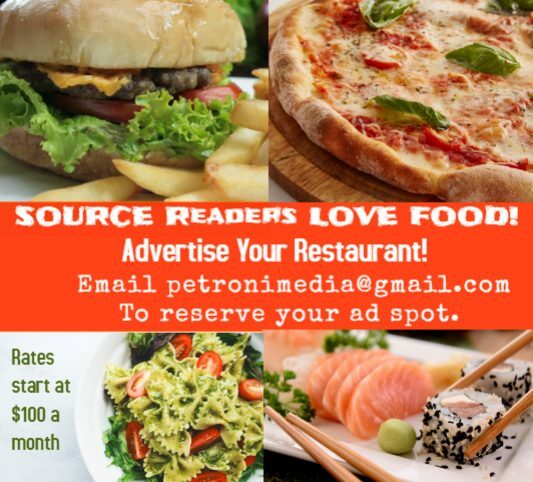 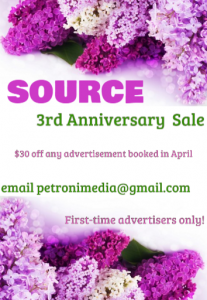 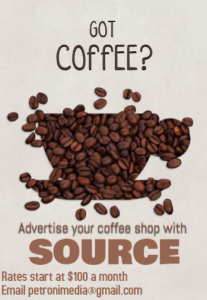 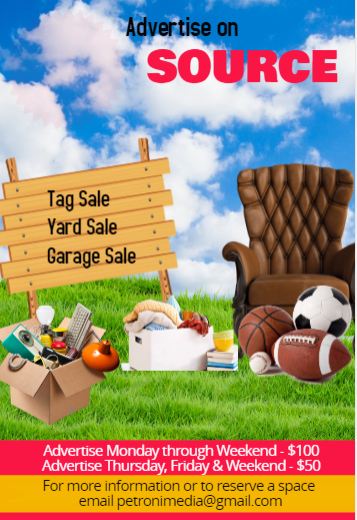 This helped to guide their work using Lucidpress to produce their magazine articles. 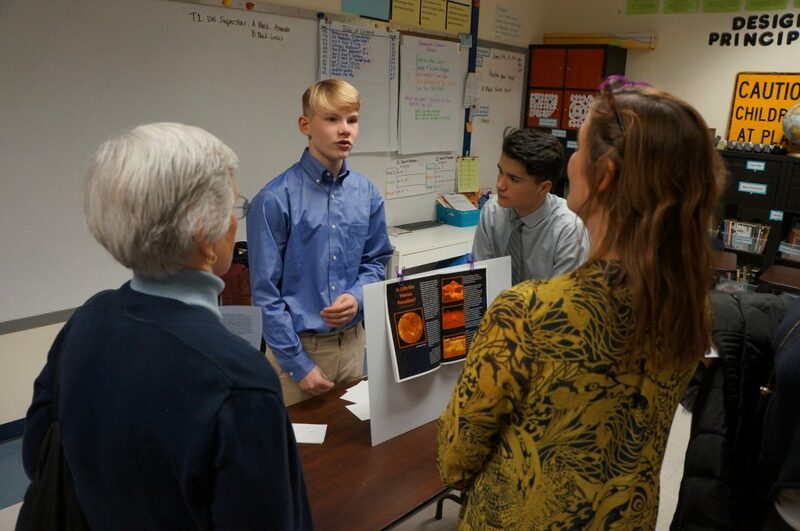 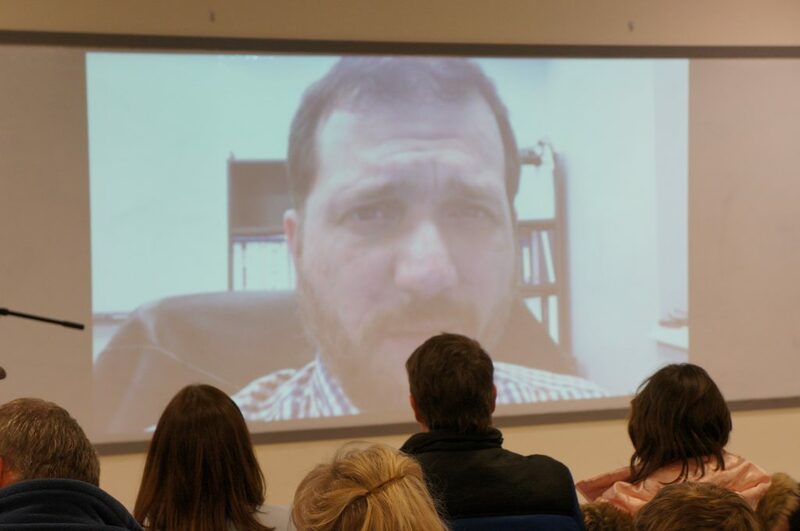 “The presentations were solid and well-choreographed, the products were astonishingly professional (many of them looked like Scientific American!) 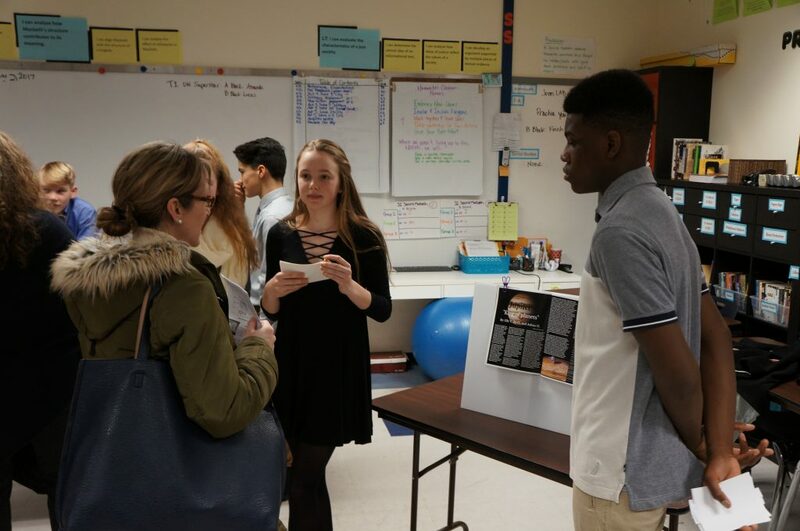 and the scholars I talked to were engaged, informative, and well prepared,” said Anne Rookey, a parent of McAuliffe Scholar, Class of 2017. 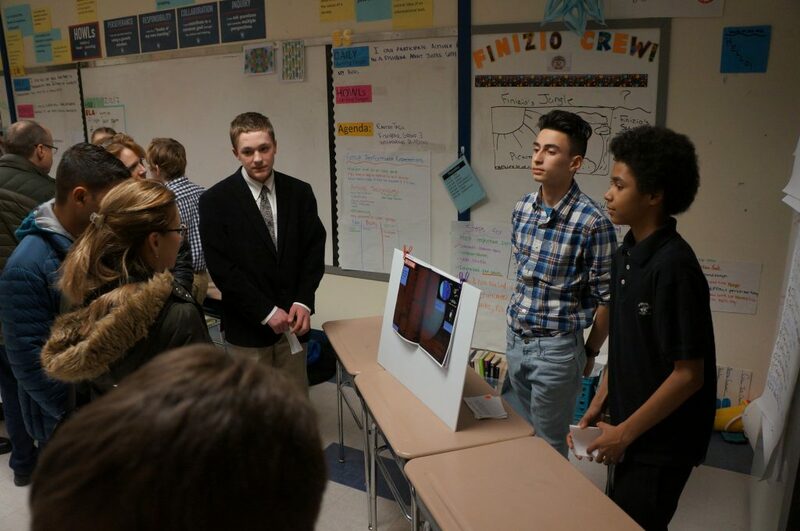 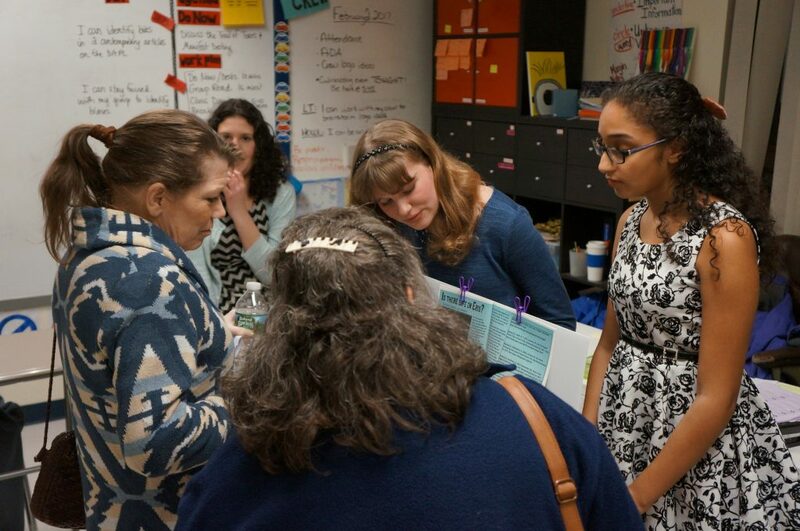 Part of McAuliffe’s expeditionary learning program calls for scholars to produce high-quality work; the whole school supports, celebrates, and reflects on student work in order to create a culture of excellence. 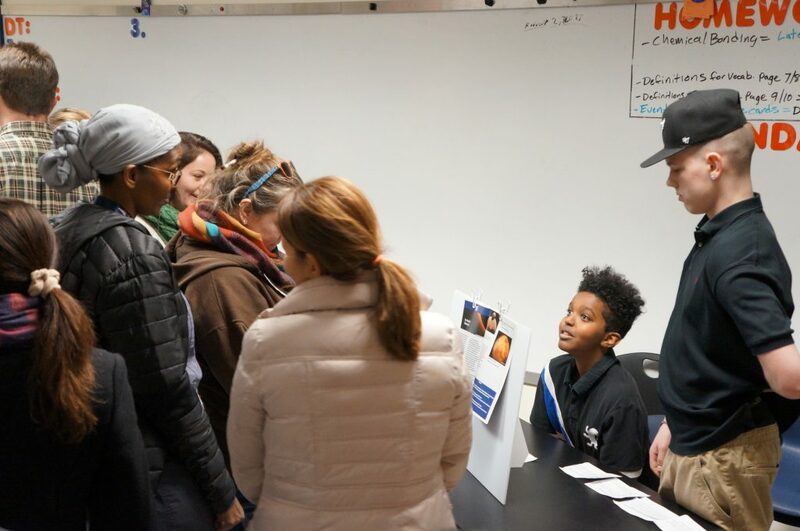 Creating real work for real audiences motivates scholars to develop perseverance and realize that they can do more than they ever thought they could. 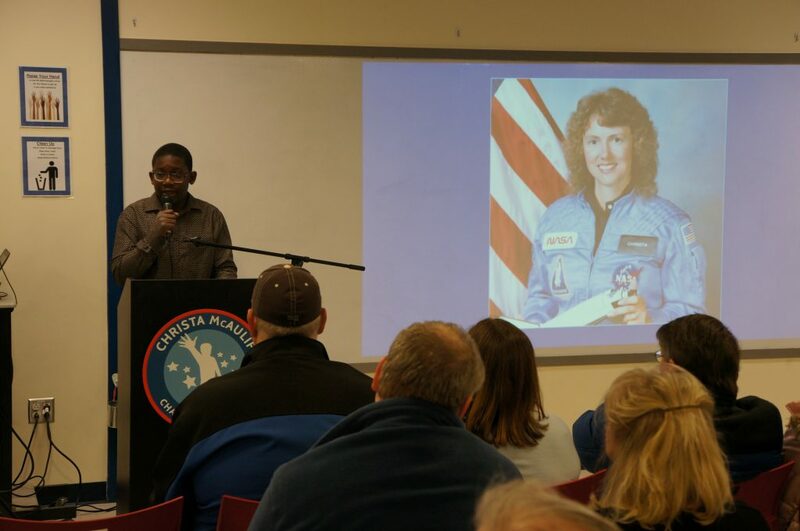 The Christa McAuliffe Charter School is a diverse expeditionary learning public school for students in grades 6 – 8. 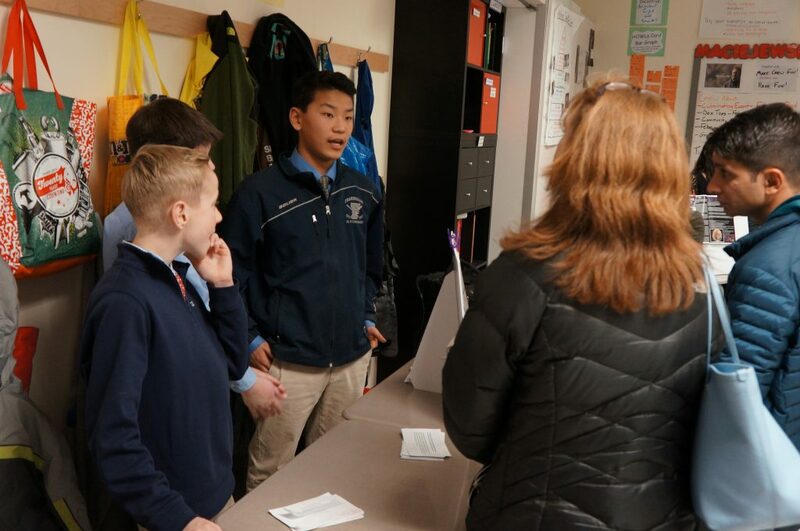 The school’s hands-on curriculum cultivates high levels of student engagement, responsibility for learning, and enduring character growth. 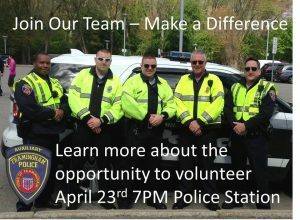 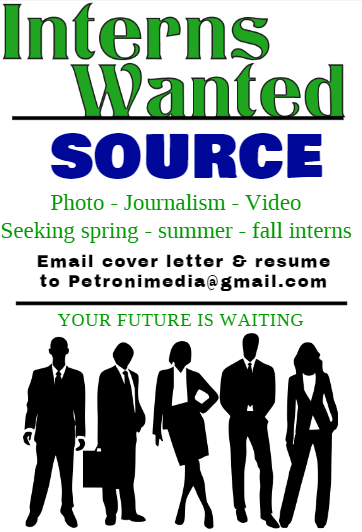 Students are accepted via a blind lottery in the spring.